Gareth Southgate is sat opposite a reporter. He’s polite, bordering on gawky. Which is just as well – a less even-tempered man wouldn’t put up with this interview. The questions come not from prepared notes, but from a large black holdall, which contains various playing shirts. Southgate is invited to rummage inside and pick a few out. The numbers on the back correspond to pre-supplied readers’ questions. This wasn’t an awkward encounter in a high-gloss Football Association spin room after England’s run to the World Cup semi-finals. It was, in fact, a quarter of a century ago. Southgate was still an up-and-coming Crystal Palace defender and Match, Curtis’ employers, were changing the game. Such stunts weren’t part of football coverage before the early 1990s. When Curtis first joined the magazine in 1987, he was trusted with the number for a payphone on the wall of Liverpool’s inner sanctum. It was a world of landlines, easy access and slow news. “You could ring up Melwood ask for Stevie Nicol or whoever and he would come to the phone,” he remembers. “Or you would have players’ home numbers. You would know that if you gave them a call in the afternoon – after training in the morning – there was a good chance you could catch them. The endless reverb of 24-hour news and social media didn’t exist. Match and rival Shoot were the only regular coverage the national game received beyond the newspapers. Shoot, launched in 1969 under a masthead heralding “a terrific new football paper for boys”, was the original, better-funded title. Match, based out of London in Peterborough and 10 years younger, was an apeing upstart. Short of the same backing and readership, it had plugged away each week with similarly earnest stories and consistently less success. Curtis scored an immediate bullseye with the target audience. With play-by-mail football games still popular and new computer versions hampered by glitchy technology, he created a feature in which a fictional team’s fate rode on the reader’s answers to multiple-choice match scenarios. He and his colleagues produced a made-up squad, adopting pseudonyms and posing with Peterborough United’s London Road as a backdrop. The deluge of mail that followed as readers submitted their results each week meant the feature ended up with its own secretary. Ultimately, though, Curtis grew tired of the gimmicks. He was one of several members of staff who hankered after a more grown-up audience, swapping sides to join Shoot in 1993 as deputy editor behind another former Match staffer, Dave Smith. Match’s new ethos needed fresh blood. Chris Hunt, who had previously worked on teenage music and lifestyle magazine Rage and rap magazine Hip-Hop Connection, became editor in Curtis’ wake. Tom Fordyce was one of a raft of young writers who followed. “I was still at university when this little advert appeared in the Media Guardian,” he recalls. “It was like the famous NME one requiring ‘hip young gunslingers’ – all it asked for was a passion for football and 10 ideas, no previous experience necessary. “I thought it would be work experience but I was actually paid £250 a week. This was at the point when I was doing £3.50-an-hour gigs in fruit-packing factories. Straight news was old news, and Match morphed into a hypercolour neon splatter of off-beat features, loaded with pictures and proto-lad humour. There were cheerfully-posed photo tours of players’ houses. Pre-season portraits were transformed into gargoyle caricatures by mirroring one half of a player’s face. 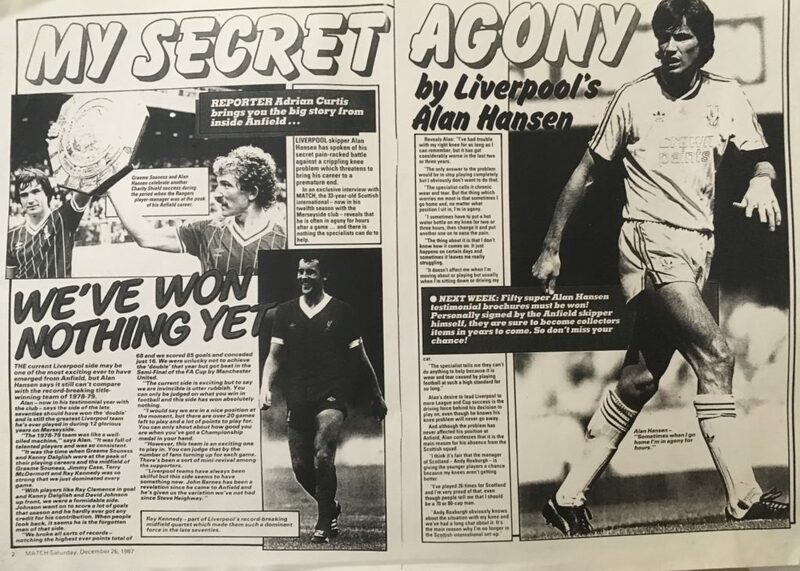 ‘Scales of Justice’ was a joke column in which Liverpool and England defender John Scales would apparently give his verdict on a big pop culture issue; ‘Juke Box Durie’ similarly featured Scottish veteran striker Gordon Durie offering ‘his’ opinion on the latest releases. Meanwhile, Matchman – a cartoon character – romped around the pages, giving his forthright views on music, fashion and, just occasionally, football. Match Facts – an in-depth statistical breakdown of the week’s results with individual player ratings – remained in the centre pages, but everywhere else the hunt was on to capture Generation X’s stuck-at-home younger sibling. It worked. Shoot, for so long out of sight, were soon overhauled. By 1996, Match sold more than 200,000 copies a week, almost double what their rival – who were reluctant to abandon the old formula – could manage. It was a perfectly timed tack south in the age bracket. In the late 1980s, football was in danger of becoming a backwater bypassed by the mainstream. English teams were out of Europe, their fans dwindling and demonised. But an Italia ’90 reboot and the rush of Murdoch millions into the Premier League meant that, come the mid 1990s, football was scrubbed up and ready to met the family once more. And the players themselves were changing. “We were always asking them about the last album they bought or getting them to show off their CD collection,” says Fordyce. “Around 1995 or 1996 it started to change. Before then it was the classics – Phil Collins, Lionel Ritchie, Rod Stewart. “I remember David Unsworth – bearing in mind he was in his early 20s as well – telling me he had just bought the new album by John Secada. They were so straight down the line. But then RnB culture started kicking in. I remember Michael Duberry and Frank Sinclair referencing some US artists. “Indie emerged and the dance scene blew up with players dropping the names of clubs and different nights. Daniel Dichio became a bit of a DJ and soon every player whose house we toured would want that classic photo of them with a set of headphones and two Technics decks, even if they had no idea how to mix. Ultimately, Match was left high and dry by a combination of technology and demographics. A swaggering slew of mega-magazines had emerged in Britpop Britain, with the likes of FHM and Loaded also racking up big sales. But it was at the younger end of the market that the pinch on print was first felt. As their early readers rushed online instead, Match’s sales fell to a quarter of their mid-1990s peak by 2010. The magazine still exists, but only just: fewer than 20,000 copies are sold each week. The recent vogue is for football magazines reborn as batch-brewed, high-fashion numbers complete with heavyweight paper, full-page nostalgia pictures and cultural chin-stroking. But such titles still owe plenty to Match. For many in analogue-era, small-town Britain, it was like a Now That’s What I Call Football compilation; an incongruous, colourful mass-market mix that was the perfect primer for the scene. And every week, in their local newsagents, so did hundreds of thousands of the nation’s youth.